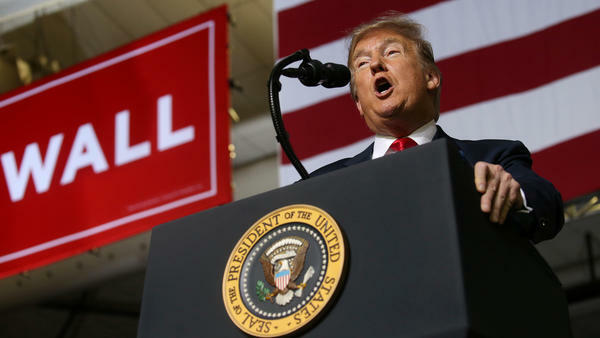 A supporter of President Trump's attacked a cameraman at the president's rally at the El Paso County Coliseum in El Paso, Texas, according to the BBC. A man in a red Make America Great Again cap violently shoved a BBC cameraman and shouted profanities during President Trump's rally in El Paso, Texas, on Monday night, in a startling moment that briefly interrupted the president's speech. The BBC's Ron Skeans was working in the area of a raised camera platform at Trump's campaign event when, he says, a "very hard shove" came out of nowhere. At the time, Trump was touting recent economic numbers to a roaring crowd in the El Paso County Coliseum. Skeans' colleagues say the apparent attack came after repeated verbal assaults on the media during the event. The BBC says it is "clearly unacceptable for any of our staff to be attacked for doing their job." "I didn't know what was going on," Skeans said, according to the BBC, describing the moment when his camera suddenly skewed down and away from the stage. Video footage showed a Trump supporter yelling obscenities as he was restrained and taken away from the area. The disruption forced Trump to pause his remarks. Shielding his eyes to see better, the president asked, "You all right? Everything OK?" He then flashed a thumbs-up in Skeans' direction. Other BBC staff members who were at the event said the Trump supporter went after a group of news teams and that the cameraman had seemingly taken the worst of it. "The crowd had been whipped up into a frenzy against the media by Trump and other speakers all night," BBC Washington producer Eleanor Montague said on Twitter. In a statement a BBC spokesperson sent to NPR, the news outlet says Skeans was "violently pushed and shoved" before his attacker was removed. "Ron is fine," the BBC says. It also notes, "The president could see the incident and checked with us that all was OK."
Trump has repeatedly called the news media the enemy of the people and accused journalists of creating fake news in an effort to make him look bad. On Tuesday afternoon, White House press secretary Sarah Sanders said, "President Trump condemns all acts of violence against any individual or group of people — including members of the press. We ask that anyone attending an event do so in a peaceful and respectful manner." She directed those with questions about security arrangements at Trump campaign events to "contact the campaign directly." The incident at the El Paso rally comes nearly two years after the president used the term "enemy of the people" in a controversial tweet to describe ABC, CBS, CNN, NBC and The New York Times. After Trump steadily used the phrase to describe the media last summer, he met with New York Times publisher A.G. Sulzberger to discuss the invective. But days after that meeting, CNN's Jim Acosta posted a video from a camera position at a Trump event in Tampa, Fla., showed dozens of the president's supporters shouting insults and making hostile gestures at the news outlet's staff. Trump's rallies have triggered altercations before, and he has discussed the idea of whether protesters who come to the rallies should be "roughed up" or punched in the face. Despite Trump's professed disdain for the media, he has long shown a hunger to make headlines and gain attention for himself. At Monday night's rally, for instance, he pointedly drew the rally attendees' attention to the bank of media who were covering the event. "Wow, look at all the press back [there]. Can you believe that?" Trump said, prompting loud boos to echo through the auditorium. "This is like the Academy Awards used to be," the president said. "They've gone down a long way since they started hitting us a little bit, right?"